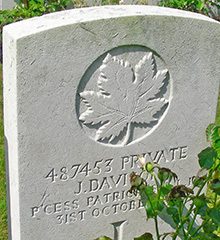 Private James Davison was born on 3rd June 1887. He was the son of Andrew and Clara Davison, of Drumrot, Moneymore, County Londonderry who moved to Vancouver, British Columbia. 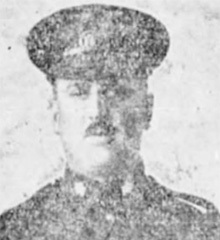 James lived and worked in Calgary, Canada as a travelling salesman before his enlistment. He died on 31st October 1917 and is buried in Grave 8-B-20 at Nine Elms Cemetery, Belgium. He is commemorated on Moneymore War Memorial (Assembly Rooms) and First Presbyterian Roll of Honour, Moneymore.